Mention the Dynaco ST-35 to an audiophile, and they may give you a perplexed look. Perplexed because this Dynaco amplifier was produced in small numbers and is hardly known in the audio world. Most often it is confused with the Dynaco SCA-35 which was an integrated amplifier(pre-amp and amp in one unit). Unlike its bigger brother, the Dynaco ST-70, the Dynaco ST-35 produced 17 1/2 watts per channel(half of the ST-70). The ST-35 is the rarest of the Dynaco tube audio equipment, and is very difficult to find these days. Once in a while it shows up on internet auction sites. It has a market value of approximately US$250.00 for a used one in excellent to mint condition. In 1964, its list price was US$62.95. The Dynaco ST-35 was a very special amplifier because of its very small size, and fantastic sound which it produced in spite of its small size. It measured 13 in(L) X 5 in(W) X 4 in(H). For a small amplifier it weighed a lot - 16 pounds. This is exactly one-half the weight of a Dynaco ST-70. This was due to its power supply transformer, and the two output transformers(heavy iron). The ST-35 became famous amongst the audiophiles for its fantastic iron. 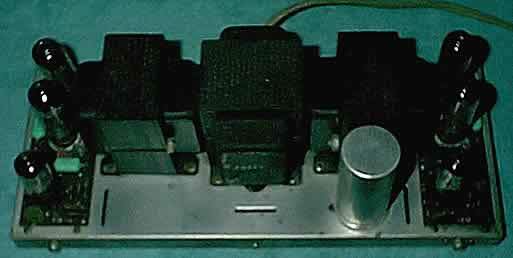 The output transformers were the famous Z 565. Some people believe that this iron was the very best that Dynaco ever produced. Some believe that the transformers were even better than the famous A 470(454326) transformers in the Dynaco ST-70. Like the output transformers in the ST-70, the ST-35 output transformers are also ultralinear. This means part of the primary winding on the output transformers is taped to the EL84 output tubes. The output transformers have taps at 8 ohms and 16 ohms. Considering the ST-35’s small size, it is amazing at the sound that this amp can produce. The ST-35 is equally as comfortable running as a bookshelf amplifier driving bookshelf speakers, as it is working as a living room amplifier driving large living room speakers. The power supply of the ST-35 is solid state (two silicon diodes). This is very different than the ST-70 which uses a vacuum tube 5AR4/GZ34 rectifier(although the tube bias uses a selenium rectifier). The driver/output circuit boards are separate for left and right. This is unique for Dynaco because in the ST-70 only one driver board was shared by both channels. Unlike the ST-70 which had the driver board separate from the output tube sockets, the ST-35 has the driver and output circuits on one circuit board. The driver tubes were one 12DW7 or 7247 for each channel. These tubes are very difficult to find these days as NOS. The output tubes were 6BQ5/EL84. Fortunately, these are still readily available today as NOS and as current production tubes. Two were used for each channel. The 1964 Dynaco brochure lists the intermodulation (IM) distortion at less than 1% (each channel) for 17 watts. At "average listening levels" the IM distortion is listed at below 0.1%. This is very good for a tube amplifier. Contrast that to modern solid state amplifiers which have IM distortion at one tenth this value (0.01%). The ST-70 had approximately the same IM at full output (35 watts/channel) - less than 1%. However, at average listening levels (1 watt), the IM is listed at less than 0.05% (one half the IM of the ST-35). This would be expected since the ST-35 is based on different circuitry and a different driver and output tube compared to the ST-70. Hum and noise is listed for the ST-35 at greater than 80dB below 17 watts for each channel. This would make the hum and noise inaudible(which is what is stated in the Dynaco specifications). The ST-70 has slightly better hum and noise figures - 90 dB below 35 watts on each channel. This is probably due to the vacuum tube power supply of the ST-70, and the presence of choke filtering in the power supply. Years ago speakers were not as efficient as they are today. So a low wattage amplifier might not have produced that much sound pressure compared to its higher wattage brethren. Today, loudspeakers have very high sensitivities. It is not uncommon to find speakers with sensitivities of typically 91-95 dB. So, a lower powered amplifier can easily fill a living room with sound. Witness the popularity of the single ended tube amplifiers with only 5-8 watts per channel of power. Hence, the Dynaco ST-35 is quite capable of filling a living room with loud sound, just as long as high efficiency speakers are used. What is so remarkable about this amplifier is its very small size. It can easily sit on a book shelf which is convenient if the amp is driving bookshelf speakers. It can be hidden out of the way if need be, but it is so cute looking that you may want to show it off! The EL84 tubes generate less heat than EL34 tubes so the ST-35 runs cooler than its bigger brother. Like the ST-70, the Dynaco ST-35 was produced in various versions. The chassis was always nickel plated - never chrome plated like the ST-70. So the chassis has a dull metallic look to it. The earliest output transformers have the number Z 565 stamped on them. These transformers were hand wound in the USA. Later versions were manufactured in Japan and were machine wound. Eventually the part number was changed to 454565. The earliest power transformer was made in the USA and had the part number PA 774. Later versions were manufactured in Japan. Dynaco has a unique history because the founder, David Hafler, had originally co-founded Acrosound. This company became famous for its tube transformers. Eventually, Hafler parted Acrosound and created Dynaco. It is not surprising that Dynaco had very special and unique output transformers in it amplifiers considering that Hafler had the knowledge to create these very unique transformers. So Dynaco, despite being relatively inexpensively priced compared to other amplifier manufacturers, had very special transformers in its products. This fact is not that well known. Some people purchase old Dynaco amplifiers for parts just to get at those special output transformers - heresy! Early Dynaco ST-35 amps had brown cages. This was later changed to black. The ST-70 has a very similar history. Early versions of the ST-35 had light brown labels with the words Dynakit and Stereo 35 printed on it. Dynakit was in real writing. Then the labels were changed to dark brown in color. Later versions simply had Dynaco in capital letters printed on a black label. For testing and comparison, the ST-35 was tested against the ST-70. For consistency and keeping with the 1960’s when these products were manufactured, a Dynaco PAS 3 pre-amp was used. Records were played on a Dual CS 505-3 belt drive turntable. CDs were played on a Parasound C/DX-88. Speakers were Paradigm 11se Mark II. These speakers have a room sensitivity of 92dB and an anechoic sensitivity of 89dB. These speakers have a nominal impedance of 6 ohms and a minimum impedance of 4 ohms both of which are lower than the 8 ohm impedance of most speakers. Despite the lower impedance of the Paradigm speakers, the Dynaco ST-35 coped with it very well. The ST-35 has output transformer impedances of 8 and 16 ohms. It should be noted that the Dynaco ST-70 has output transformer impedance taps at 4, 8, and 16 ohms. The frequency response of the ST-35 is rated at +-1 dB 10Hz to 40kHz. The frequency response of the ST-70 is rated at +-0.5 dB 10Hz to 40kHz. In listening tests, it became obvious that the ST-35 produces less bass than the ST-70. The EL84 output tubes in the ST-35 are smaller in size than the EL34 tubes found in the ST-70. They characteristically do not have the bass response of the EL34 tube. So, although bass is present in the sound produced by the ST-35, it just can’t compare to the thunder of the ST-70. This in spite of the fact that the ST-35 has solid state rectification. Solid state rectification by its nature tends to yield more bass than the vacuum tube counterpart. For example, the bass response of the ST-70 can be made greater by the switch to solid state rectification as in the Dynaco ST-70 Series II(see previous articles on original Dynaco ST-70 versus Dynaco ST-70 Series II in TNT Audio). The ST-35 has a wonderful sound with fantastic midrange response. The human voice in singing comes through very smoothly. The ST-35 really shines in the midrange. The midrange is exactly where the human voice is positioned on the frequency scale. So although bass response is subdued, midrange come through almost lifelike. Even more so than in the ST-70. The sound of the ST-35 is sweet and smooth. It is mellow and laid back. "Easy listening" are two words which aptly describe the personality of this amplifier The volume capability was less than the ST-70, but this was expected since the ST-35 is rated at one-half the wattage of the ST-70. Nonetheless, there was sufficient volume to fill a medium size living room, and even then the volume control was set at only the twelve o’clock position. Although the ST-35 has the power to fill a living room, it is best at home in a smaller room. In such an environment, it can produce ear splitting volume if needed, especially with CDs which have a relatively large dynamic range. The Dynaco ST-35 is rare and difficult to find. Demand has outstripped supply, so when an excellent to mint example is offered for sale, the price escalates on internet auction sites. If you come across one that meets your approval, it is probably a good time to purchase it. You will be rewarded with a sweet pure sound like none other, and you will have the satisfaction that you are listening to the rarest of the Dynaco amplifiers. Good things do come in small packages. Thanks to the work of one of our readers (Tiziano Di Natale) here's a PDF copy of the original Dynaco ST35 manual.